HOW DO YOU BEAT A SERIAL LIAR IN A LIVE TV DEBATE? If you haven't watched the first presidential debate I highly recommend doing so. It's an awesome display of... well you be the judge. One interesting sign of the times from a comms POV. 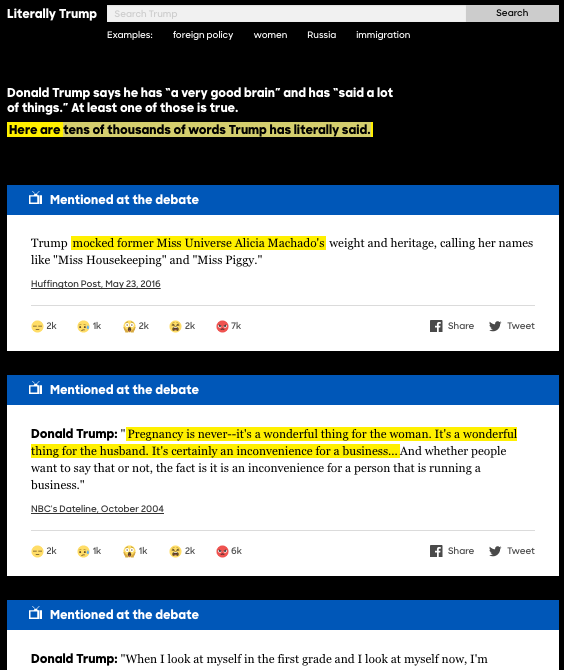 Immediately after Donald told his first lie (about 5 mins in), Hilary invited viewers to go to her website which was running a live 'fact checker' on the debate. It both sources her own facts, and dispels Donald's lies. '10 things brands need to learn about second screening from Hilary Clinton', is an article that will probably appear on Linkedin feeds near you soon. Whether it will help in the 'post-factual' era, I don't know, I can't help but think she also needed a disruptive (*BUZZ WORD CLAXON*) way of getting those fact checks out there, maybe hijacking Trump supporter hashtags etc rather than just preaching to the converted.